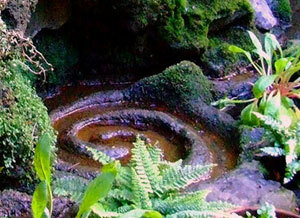 In honour of the Spirit of the White Spring, a Temple has been created here in gratitude for the gift of pure water. 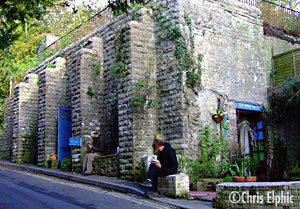 A Victorian built Well House that nestles beneath Glastonbury Tor was ideal for this purpose, a blessing indeed. Cavernous and set apart, in blackness or candle lit, mysterious it remains. A wonderful contrast to the sunlit gardens of Chalice Well of the Red Spring. The interior consists of three domed vaults 16ft high, with beautiful bowed floors - like the hull of a boat moored at the portal to the Otherworld. With it's constant temperature, and the sound of the perpetually flowing water, it is a unique and sacred space. A series of pools have been built according to the principles of sacred geometry, and simple shrines in honour of the ancient energies and spirits of Avalon have been created within the temple. All enhanced by the ley line known as the Michael line which flows through this place. We honour Brigid as guardian, Our Lady of Avalon, the King of the Realm of Faery, and their ancient presence in this sacred space. The companions of the White Spring, men and women who give their time and expertise freely, have designed, built and created the temple and continue to care for it, inspired and greatly helped by the blessings of spirit. Many groups, pilgrims, and local people - from a wide diversity of backgrounds and traditions - have come to appreciate the blessings of this sacred space. So do come and enjoy the White Spring during our normal opening hours or at our regular ceremonies and meditations. We gather together to celebrate the turning of the seasons and at the full and dark moon. Private visits and ceremonies, including baptisms and ceremonial bathing may be possible by arrangement. In keeping with the sense of sacred at the White Spring there is no charge or expectation of donation, neither is anyone paid. Feel free to explore this mysterious, candle-lit sanctuary. Listen to the water, the white spring flowing from deep within the tor; for it has memory. This is a sanctuary, a sacred place set apart. Sound echoes and amplifies so please do not hold extended conversations within the building. A song or a tune however is welcome; please check with the keeper on duty if you wish to play loud musical instruments. When you arrive, please take a moment to allow your eyes to adjust to the restricted light before descending the three steps into the temple. You are welcome to step into the water in the temple pool (depth 2ft). Or if you wish, go deeper, even to complete immersion, in the healing pool (depth 4ft 6in) but please inform the keeper on duty before entering. Explore the shrines, special places for reflection, inspiration and healing. Stay as long as you wish. There is no charge. Caution, naked flames, deep water and faerie portals. Enter at your own risk. The floor is a little uneven and it is wet in places. It is nevertheless accessible to those who are unsteady on their feet. We offer wheelchair and pushchair access via the side door. Children are welcome (dogs too) but they need to be closely supervised. The use of drums or any other loud instrument should be minimised as this is essentially a place of quite reflection. Please check with the keeper on duty if you wish to play drums or loud musical instruments for up to 15 minutes in the sanctuary or garden. There are times when it may not be suitable. Drumming is primarily reserved for rituals, and should not extend beyond 15 minutes maximum at opening and closing of ritual. Large groups or rituals need to be arranged outside of public opening times. Please contact us two weeks in advance to arrange a private booking. The use of cameras, mobile phones and any electrical equipment is strictly prohibited to protect the very special atmosphere here. Further correspondence details can be found on the Contact Page. Please be aware opening times are dependent on volunteer cover and due to this may occasionally vary. More information on using the space can be found on the Home Page.